Rating Pending. Following the fall of Akenash tower, an extraordinary matter has forced Styx out of hiding and into Korrangar, city of the Dark Elves. Supposedly impregnable, a diplomatic summit offers Styx a chance at slipping in unnoticed. His infiltration complete, Styx will stop at nothing to accomplish the robbery of a lifetime - stealing a scepter of immense and indomitable power. 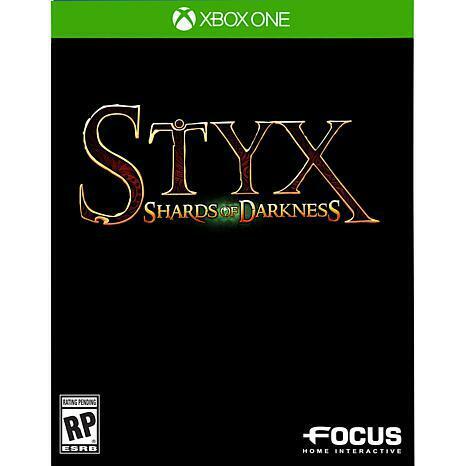 Embark upon a stealthy adventure with new enemies, new environments, and a plethora of new mechanics refining the abilities of Styx -- grappling around corners, climbing ropes, and using his trusty knife to zip line! Grapple, climb and zip-line - Diverse abilities and improved stealth mechanics open up new possibilities to reach unfamiliar ground. Skills that kill - Upgrade abilities and use lethal tactics to defeat enemies; even utilize a murderous clone. Drop-in/drop-out Co-op Mode - Sneak and stab your way through missions with a friend at any point within the game. Vicious rivals - New monsters to defeat in the cryptic city of Dark Elves. Impressive new environments - A brand new engine brings beautiful graphics created in Unreal Engine 4.Rating Pending.Action and Adventure. MAXIMUM FAMILY GAMES USA.